Asahi got her copy of Betsucomi several days early this month, so this month we were able to bring you RAWs and a summary of the chapter before it's even released in Japan! Thanks so much, Asahi! As many of you may already know, the FINAL CHAPTER of Dengeki Daisy has been announced, with the anticipated release date of October 12th, 2013! It won't be much longer now...! The tagline on the title page of this chapter is "In order to protect my beloved person and [our] precious future...!!" and the title of the chapter is "For our Future." 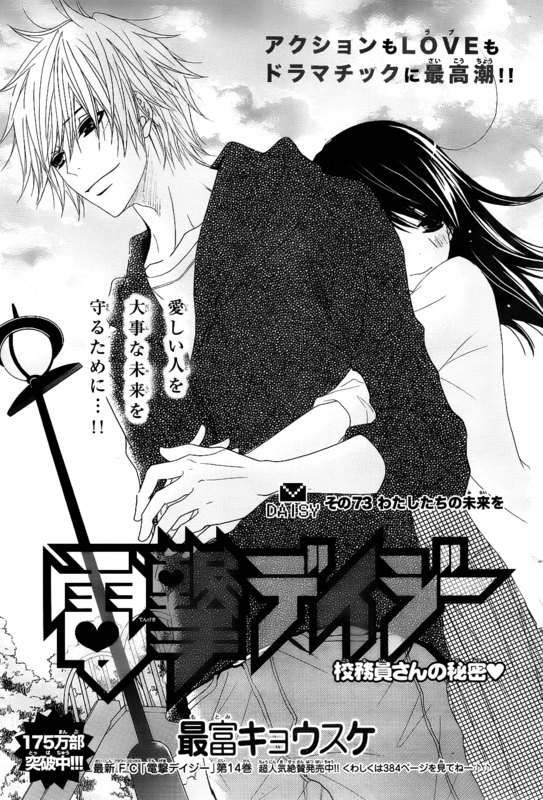 As usual, the first page recaps the end of the last scene: Teru announces that she'll go after Akira and buy them time for Kurosaki to unlock the "extra time" program. Master protests, telling her that this is no time to be joking. Teru quickly summarizes the current situation: In as little as 1 hour, and at most in 3 hours, when Akira cracks the final layer of the "Will of M" program the entire uninhabited island will explode. There's a program on a data disk that Teru found hidden in the facility earlier that will delay the explosion long enough for Kurosaki to possibly figure out a way to prevent the explosion altogether. In order for him to have the time he needs to do that, Teru needs to delay Akira and prevent him from cracking that last code and removing the final seal. Master pasionately tells Teru that there's no way he can let her go: he will call the helicopter back immediately to collect her; even if the worst happens, at least she must make it back safely. But Teru gets an expression of strength and determination on her face and tells them that she's not saying this for such flimsy reasons as "because she wants to feel useful and have something to do," but because it is the *only* way they have any chance of success. Teru tries to reason with Master, telling him that since she was also injected with the same drug she knows how debilitating it is and how slowly the antidote works, and also that he's needed to contact the helicopter and arrange their escape, something she can't do. Master still tries to dissuade her, warning her that she really could die, but Teru insists that she won't die, because she has absolute confidence that Kurosaki will save her. She then turns to Kurosaki and asks him to confirm it, "You will save Akira and I, won't you?" He looks shocked and taken aback at first, but Teru goes on to say that neither leaving Akira to his fate nor any of them being sacrificed is an option. Teru tells them to believe in her, because their faith in her will become her strength. And she asks them to make the difficult choice, the right choice, and send her in. Teru's speech reminds them of how Souichirou always used to guide them with his strength and courage, and Kurosaki thinks to himself that Teru really is his younger sister. He finally agrees to leave Akira to her. As Kurosaki unlocks the gate to the elevator and Teru prepares to leave, there are only 2 hours and 50 minutes until the explosion, if Akira doesn't detonate it first. Master tells Teru to be careful, and makes her promise that, if it looks impossible, she will turn back immediately. After the door opens, Kurosaki approaches to speak to Teru and Master bows out to give them a moment alone. Teru cheerfully tells Kurosaki that she'll be going now and he tells her he's counting on her. Then Teru tells him "Let's survive and meet again, for sure, okay?" and he responds "Of course. You said it, didn't you? I will protect you." Then he kisses her <3 After a brief moment, they separate and Kurosaki pushes the button to close the gates. The two of them look at eachother, wordlessly, with expressions of determination on their faces that speak volumes. Teru narrates as the elevator descends that this was not a "farewell" kiss, because "My heart is in the place where you are." She also thinks that even as Kurosaki protects her, she will also work hard so he can see her protecting him, Akira and their future. Down bellow, Akira opens yet another gate and curses whoever designed this place for playing around with him and making him go through all the trouble of decoding encryption after encryption. The gate suddenly slams shut and Akira has to dive out of the way to get completely through before it closes on him. Lying on the ground, covering his head with his arms, Akira has a flashback of the lab where he was raised. In the memory, Akira is complaining that his head hurts like it's going to break open, and the doctor is laughing at him, saying that that's because his braincells are breaking down and dying because of the years and years of experiments he's undergone and the high levels of drugs he's been dosed with. The doctors warn him that he'll start losing his memory and that any day now he might not be able to function normally in every day life anymore. That is unless he cooperates with them like a good boy, in which case they'll continue to give him a "special medicine" that will hold the pain in his head at bay and might even improve his condition. He has another memory of the nurses complaining that he's collapsed again and saying that they wish he'd hurry up and die already because his episodes are troublesome for them to deal with. In the third memory, a male lab tech is laughing and telling a female lab tech that he ordered Akira to act like a dog and stepped on his head and it was really funny how Akira totally lost it. The female lab tech chastises the man, telling him that Akira is "useful" and the people on top want them to treat him carefully. Modern-day Akira narrates, among these flashbacks, that everyone was always treating him like a fool. The next flashback is of the day he met Antora. Akira is chained to a hospital bed, and Antora comes to him and introduces himself as a special consultant at the facility where Akira's being held. We see a nurse in the back ground who I'm almost certain in Chiharu. Antora explains that the facility where they are now is actually a front for a criminal organization, and that he infiltrated the facility undercover because he's been charged with bringing it down from the inside. Antora says that he wants Akira to help him, in exchange offers information about "The Will of M." Antora says that "The Will of M" is rumored to be the articles left behind by Professor Hideo Midorikawa for an unknown person who was precious to him. Antora tells Akira to take back his freedom and then find out the truth about The Will of M for himself. In the present, Akira struggles to get up from where he's collapsed on the floor. His next flashback is of Chiharu. They are on a mission together, and Chiharu is yelling at him for looking down on everyone, saying that she'd not have anything to do with him if it wasn't her job. She calls him a damn brat and tells him to stop feeling bad for himself all the time, claiming that there are a lot of other people who have also suffered because of him. The next flashback is more recent: Chiharu bringing him to this island by boat. She tells him that this is as far as she can help him, and that the answers he seeks are inside. She wishes him well, and tells him that she hopes he comes to understand what meaning there was in his surviving everything up until now. The final flashback is of Professor Midorikawa leaving on a trip. Professor Midorikawa tells Akira that when he gets back, they'll celebrate Akira's birthday. Akira asks him if he remembers their promise, to which Professor Midorikawa replies that he does, and tells Akira to look forward to it. Akira narrates that if that [is/was] a lie, he's done. Thinking of Teru's warning that "The Will of M" is just a trap to lure him out and kill him, Akira continues stumbling down the corridor, and narrates that it that's true, then he's fine with it; he'll be completely devastated and will be able to welcome the end of everything. The focus switches to Teru, who is making her way quickly through the labyrinth. She radios back to the guys and reports that it's open all the way to the 16th gate, and that she's continuing strait down. Master responds and tells her to report back if she spots Akira. The radio transmission is not good, probably because she's so deep underground, and Master's voice comes out fuzzy, but still understandable, for now. Back in the chapel, Master reports the radio interference to Kurosaki, but remarks that Teru's making excellent progess, passing through the gates one by one without any dely. Kurosaki tells him that that's because he's using Jack Frost to interfere with the system and deactivate the locks. Kurosaki thinks to himself that it feels so weird to be using Jack Frost again, and especially to be using it like this. He pictures Teru and thinks that so much has happened and he's finally been able to come to turn with his sins and "have a present." Suddenly Kurosaki's contemplation is interrupted by a furious beeping. It's the computer alerting that the encrypted data on the flash card Teru found has been completely restored successfully. However when they look at the contents, there are only image files, pictures of some random people they don't recognize. Kurosaki starts scanning them for embedded data, logically starting with the image with the largest file size. This pays off, and he uncovers an aerial map of the island, with X 's marked at the location of the facility where they are now and one other place, marked in blurred letters as "Escape Gate" in English. (I think that's what it says. In Japanese Kurosaki says 排出口 or "outlet.") There's also a text file, which turns out to be a long document written entirely in English. Master asks Kurosaki WTF it is, and guesses that it's the source code for "The Will of M," but Kurosaki, who apparently can read English fluently, tells him that it's the diary of the person who created the "Will of M" system. In the diary, the creator explains why he remodeled the source code. If you read the English snip-its on pages 28 and 29, you'll get an idea of what happened, but apparently the author isn't going to explain it clearly until the next chapter. Anyways, Kurosaki suddenly suddenly says that he understands, and when Master asks if he means that he understands how to stop "The Will of M" but Kurosaki says no, that what he's understood is that there's no way to stop "The Will of M." Before Master can question him in more detail, there's another call from Teru over the radio. Although there's a lot of static, we get the basic jist of Teru's message: She's spotted Akira and is going to make contact with him now and stop him from opening the last gate. The reception is bad so she'll probably lose contact with them. She asks Master to tell Kurosaki she'll do her best. Master panics and asks Kurosaki if there's really no way to stop "The Will of M," what will happen to Teru and Akira? Kurosaki doesn't answer, but stands up dramatically with a determined expression on his face. The focus switches back to Akira, who has just made it through the last gate and come to a small room with a huge safe-like metal door on the far all. Akira also says that it looks like a safe. He is overcome with emotion and begins to laugh maniacally and cry at the same time, saying, "It's in there...? Finally...!" Just then, Teru comes through the gate behind him and calls out to him, telling him she won't let him open it. Akira tells her not to screw with him and asks how/why she followed him all the way down here. Teru's answer is "Isn't it obvious? To beat some sense into you." (Actually she says something more like "to beat your nature back into shape" but this is what she meant.) On the last page, Teru rolls up her sleeves and prepares to stop Akira with force if necessary, and narrates that there's no point in giving in to despair, because there's still something they should be doing. The next chapter will be released on September 13th, 2013. Asahi also scanned an extra page for us this month, an article about an autograph session that was held recently. The beautiful middle aged Japanese woman with the grey shirt is the author, Motomi Kyousuke! aaaaaaaargggg just 2 chapters more!!! Thankyou so much Icarus san and Asahi san. aww poor dengeki daisy for ending so soon.. ;( hopefully there will be a sequel! OMG only 2 chapters left, noooo!!! BTW Does anybody know what program to use to be able to read the chapter on a macbook pro??? it's so sad that they're going to stop making DD... Hovewer it makes sense because it won't be the same anymore when they're official lovers... The mystery about Daisy is revealed... so.. Yeah.